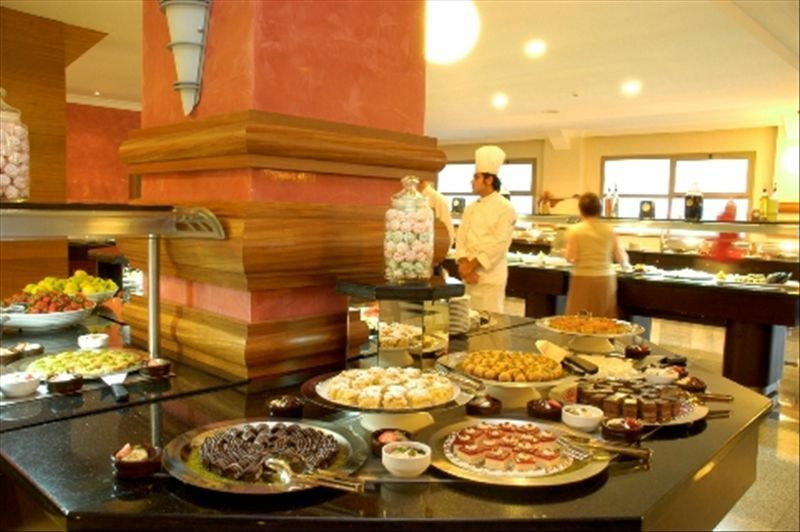 Grand Pasa Hotel is an excellent resort with 280 air-conditioned rooms and offering you with luxurious 5 Star services. Each of the tastefully decorated guest rooms has an individual private balcony with a pool and hotel garden view and have direct dial telephones, internet connection, mini-bar, satellite plasma TV, en suite bathrooms with bathtub and a shower and hair dryer, split air condition, central heating system and telephone connection in bathrooms as well. The reception is open 24 hours a day, and the receiving staff welcomes you with a smile whenever you check in here. The check-out services and lift access is available at all the time. Clean and hygienic services offered at this resort are impressive and the food on offer has a great variety and of excellent quality as well. Children visiting here can pick special food from a separate food collection. The spa is fantastic and the Turkish bath in Grand Pasa is just amazing; it is worth your money and gives you a relaxed feeling. The staff at the restaurant, bar and the entertainment team are excellent and they serve to keep you happy although the stay at Grand Pasa Hotel. Soothe yourself among the two swimming pools at the resort, one of them is an indoor pool with hot water and the outdoor pool has cool waters to help you relax in a hot sunny day. The swimming area also has a water slide, poolside snack bar and a pool for children. Guests can also avail some other facilities like a sauna, table tennis and enjoy entertainment programs arranged here for six days in a week. Move over to the nearby sand and pebbly beaches and lounge yourself under the rented parasols and sun loungers! Guests arriving Grand Pasa Hotel will have a nice time enjoying in the TV lounge, games room or dancing in the on-site disco! 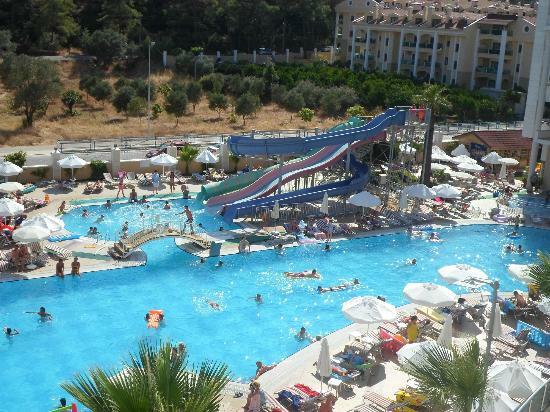 This wonderful hotel is located is just 350 meters from the beachfront and about 90 km from the Dalaman Airport. 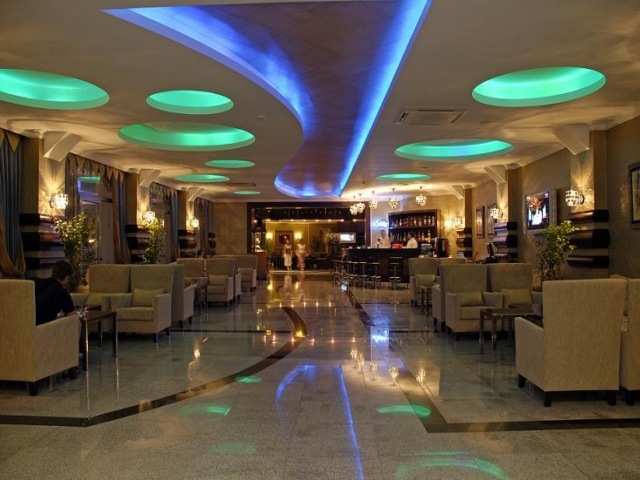 You will find a range of fine bars, restaurants, clubs and shops within a 400 meters walk from the resort. 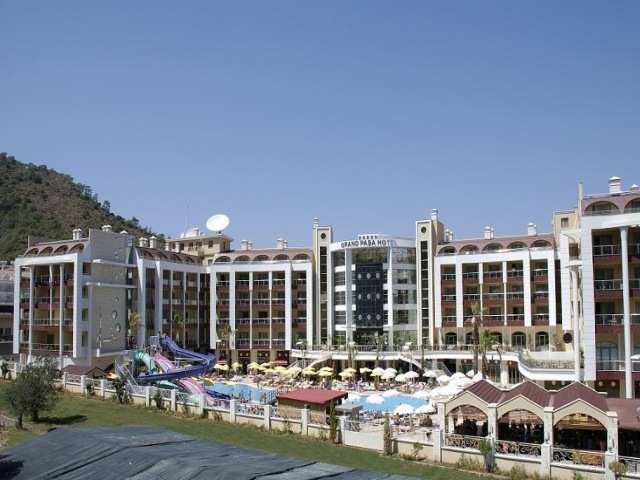 Visiting the incredible resort of Grand Pasa Hotel within the beautiful town of Marmaris will certainly give you an out-of-this-world feeling! Outdoor rectangular pool, sun terrace with free sunloungers and parasols, , buffet restaurant, two à la carte restaurants, pool bar , bar , beach bar , satellite TV room , mini-market , 24hr reception , internet café. WiFi is available in selected areas and is free of charge.